Got up early for breakfast and left for Fez. I’m on a shoestring budget for a long trip and I have been taking a bit of a financial battering travelling with Emma and John due to their willingness to pay the first price picked out of the stratosphere by the locals. 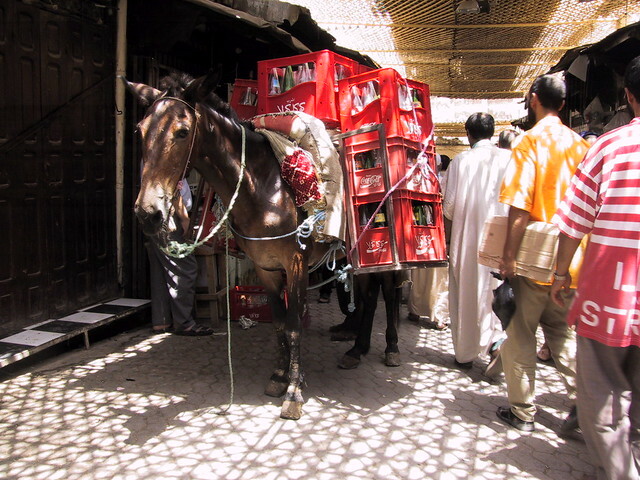 The final straw came today when I left them to pay our faux guide, Mohamed, for our tour of Fez. Faux guides are men who take you on tours but who aren’t licensed to do so. The reason that Fez has tried to licence the guides is the too many tourists have been given dodgy tours of carpet shops and other establishments where the faux guide can earn a big money through commission. This is pretty much what we got except I refused to but anything since I am trying to watch my money and anything I buy I will have to carry for the next three months. This didn’t stop Mohamed trying though and in every shop we were subjected to a sales pitch from the shop owner and from Mohamed. At the end of the day Mohamed to Emma and John to the cash machine and they paid him the equivalent of a month’s Moroccan salary for showing us around a bunch of his mates’ shops. They were a really nice couple but if I go on like this I’ll have to head back to London in a month. I have been brushing up on a little local lingo since the language seems to flip flop between Arabic, French and Spanish and almost never seems to settle on English. There are two types of taxis in Morocco. The grand taxis are mostly old Mercedes from the 70s and early 80s and are used for intercity work. The petit taxis are all Fiat Unos and are used for work within the cities. The petit taxis in each city are all the same colour and each city has its own colour, which is kind of cool. The taxi drivers here are easily the maddest fuckers I have ever had the fortune to travel with. Worse than the tuk-tuk drivers in Bangkok. Much worse. The root of the problem seems to be that they are paid solely on the distance they travel and the time they take is irrelevant. So the sooner the passenger leaves the vehicle the sooner they can endanger some other unlucky bastards life. To maximise their profits the following distances are measured in millimetres, the speed limit appears to be relative to much space you have to accelerate in and I don’t know what road lines are for but it sure as hell isn’t for indicating where you can and cannot drive. A good example of how mental these guys is occurred on our ride out to dinner this evening. Our driver sped across an intersection crowded with people honking at pregnant women and children forcing them to dive for the safety of the sidewalk. I have yet to see an old or even middle-aged taxi driver. Whether this is because their nerve breaks or if they just don’t last that long I do not know. Later that night I took off to Meknes. On my own. Today we crossed the border into the bad lands of Morocco. The border crossing was pretty wild. It was stinking hot and it looked like something out of a refugee camp that you might see on the news. There were huge piles of rubbish everywhere and hundreds of the unwashed in a massive queue trying to get back into Morocco with anything they could carry. Soldiers with automatic rifles stood on ten-foot high walls shouting at people and while we were there the soldiers dragged off at least four women screaming and wailing at the top of their lungs. Scary stuff. Emma, John and I were the only western people stupid enough to be within one hundred miles of the place. At customs they didn’t know what to make of us and I got the impression that westerners don’t usually use the border crossing between Malilla and Morocco. At least 5 people thumbed through my passport in really rough manner. I started to sweat (in addition to the heat induced sweat) because the photo page on my six year old passport is starting to come apart from the cover. I have heard that this can lead to it being refused, or worse, confiscated at border crossings. After about fifteen minutes of serious passport abuse they decided to let me through with a stern ‘don’t cause any trouble look’. They also didn’t charge me for a visa. I am not sure if this is because I wasn’t supposed to or if they just don’t have the vaguest idea where New Zealand is. It was a freaky way to enter Morocco to say the least. On the far side we greeted a local man who spoke English and greeted us by saying “Hello my friends! Where are you from?”? We needed a taxi to Nador and since he was the only person who spoke English he was responsible for sorting out the negotiations. The price was exorbitant but we were all to shaken after the border to put up much a fight so we paid up and got the hell out of there. Nador is probably pretty average by Moroccan standards but it was my first taste of Africa so I found it quite exciting. Budget wise I made a Great start to my tour by flying with Easyjet to Malaga in Southern Spain and catching a ferry to northern Morocco. This worked out about half the price of the cheapest direct flight to Morocco. I got into Malaga at 11pm and saved a small fortune on taxis and accommodation by sleeping at the airport. This is my first taste of airport sleeping and it wasn’t that bad. Early the next morning I promptly blew my savings by accidentally booking a cabin on the eight hour ferry to Africa instead of travelling on the deck like a backpacker on a budget should. These things can be quite difficult if you don’t speak any Spanish beyond “hello beautiful”? and “two beers please”?. On the ferry I attached myself to the nicest English couple. John and Emma are aspiring actors studying in Manchester and they paid a small fraction of what I did to spend the entire journey in the comfortable lounge of the ferry. Did I mention that John and Emma speak Spanish? Today’s destination, Malilla, is a small Spanish enclave in northern Morocco. Malilla works sort of like how Gibraltar works for the English only in this case it’s the Moroccans who are kicking up the fuss and not the Spanish. It’s a nice little town but I can’t say that I’d recommend it to anyone if they weren’t on their way to Morocco.